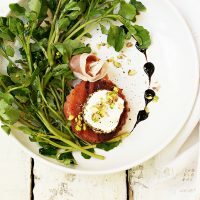 This pretty Grilled Watermelon, Goat Cheese and Watercress Salad is a delicious way to enjoy Summer watermelon, featuring grilled watermelon, fresh watercress, pepper-crusted goat cheese, prosciutto, pistachios and a bit of olive oil and balsamic. This post is sponsored by watermelon.org. As always, all opinions are my own. It’s hard to resist summer watermelon and we certainly eat a lot here, fresh and cool from the refrigerator. Watermelon is 92% water, so it’s a great way to beat the heat and for staying hydrated and regulating body temperature. It’s also low in calories and fat, so it’s always a guilt-free choice. Lift it up. The watermelon should be heavy for its size. Watermelon is 92% water; most of the weight is water. Wash watermelon in clean, running water. Use clean knives and cutting surfaces. Watermelon can be stored *uncut at room temperature for 7-10 days. Once cut, watermelon can be kept fresh in the refrigerator for 3-4 days in a plastic container or plastic wrap. Because watermelon is 92% water, it freezes well. 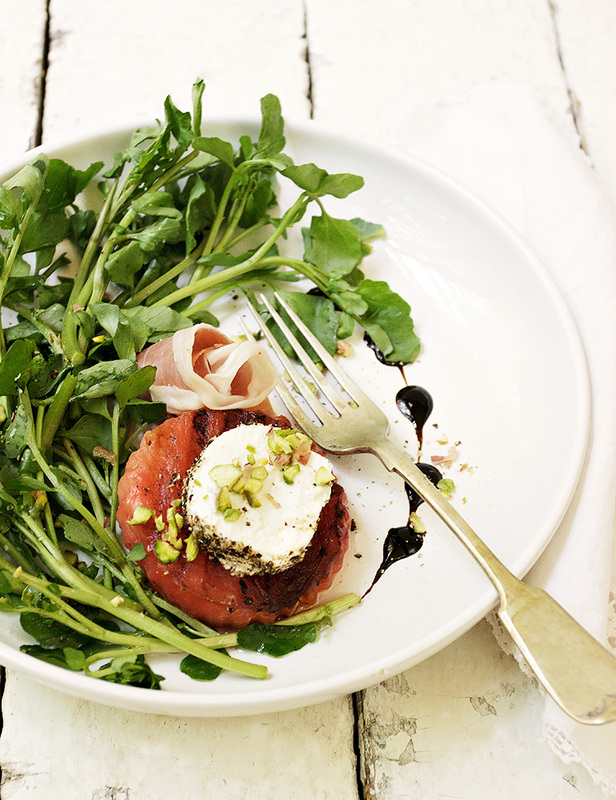 For my recipe today, I decided to grill my watermelon and make a salad with one of my favourite greens – watercress. Grilling watermelon produces something akin to seared meat. When heated, much of the water of the watermelon is cooked off, leaving a more dense and with a caramelized sugar flavour, as the natural watermelon sugars cook on the outside. 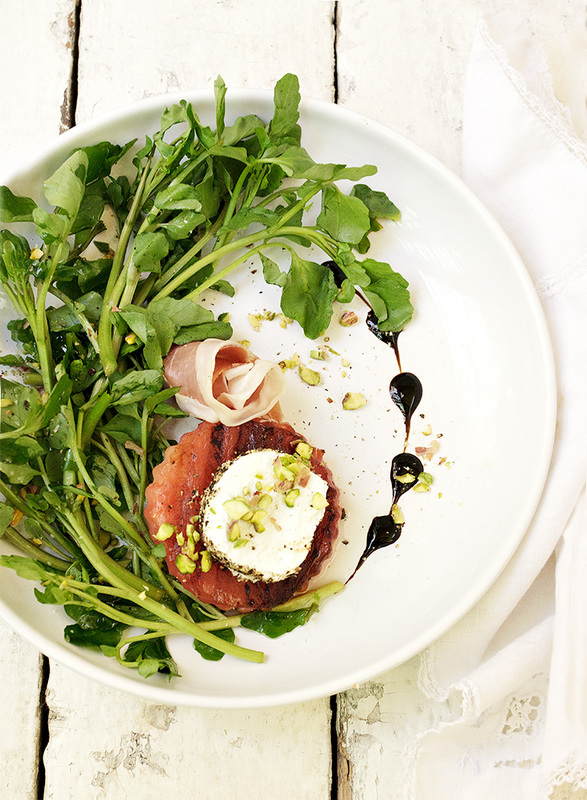 The grilled watermelon is also combined with pepper-crusted goat cheese, pistachios, a pretty prosciutto rose on the side and just a bit of balsamic and olive oil. 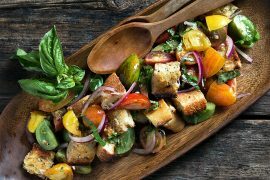 It’s a super easy salad and perfect for summer entertaining. It takes longer for the watermelon to grill than you may think. It spends the first part of the grilling time cooking off moisture, before it will start to actually grill. Allow about 10 minutes or so, but watch closely to ensure it doesn’t char too much once the moisture cooks off. An easy and pretty Summer salad, featuring delicious grilled watermelon. Serve the grilled watermelon at room temperature or make ahead and refrigerate and serve cooled. Heat BBQ or grill pan to medium-high. Lightly grease BBQ or grill pan with a bit of oil. Place watermelon pieces on grill and grill until grill marks show on the underside. Flip and grill the other side. Remove to a plate to cool. Can be made ahead. Simply cool, cover and refrigerate. Prepare the goat cheese by cutting log in to 3/4-inch rounds. Grind some pepper on to a flat plate and roll the goat cheese round edges in to the pepper, to crust the outside edge. Set aside while you prepare the salad. To make the prosciutto roses: Place a slice of prosciutto in front of you, with the long side facing you and the flat bottom length closest to you. Fold 1/3 of the prosciutto slice up. Starting with the short end, roll the prosciutto loosely, until it is all rolled up. Gently loosen the top of the rose shape to form a rose. Set aside. When ready to plate your salad. Clean and dry watercress and place in a large bowl. Drizzle with a bit of olive oil and toss. Place watercress along one side of your plate. 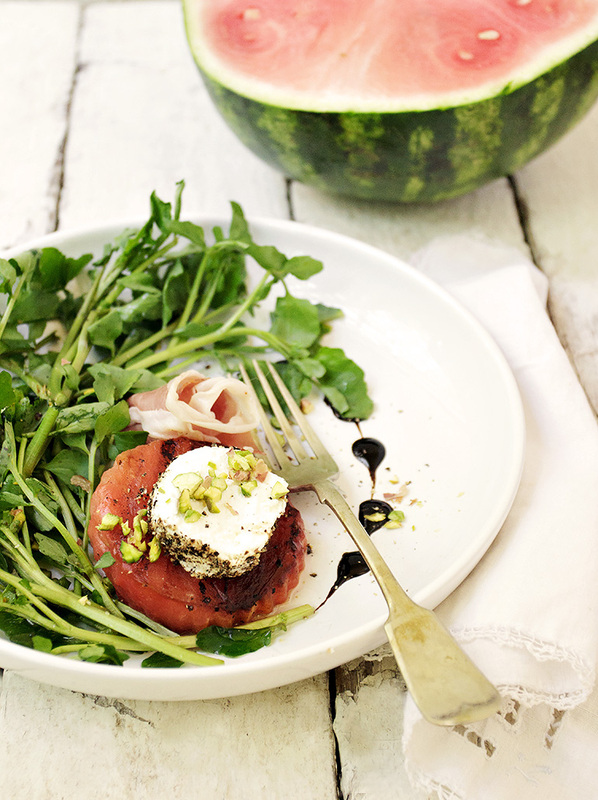 Place grilled watermelon round on plate and top with pepper-crusted goat cheese round. Place prosciutto rose next to the watermelon. Place 5 or 6 drops of balsamic glaze along the open side of the plate. Use a skewer or toothpick to run through the middle of each drop, in a line, to make a heart-like shape. 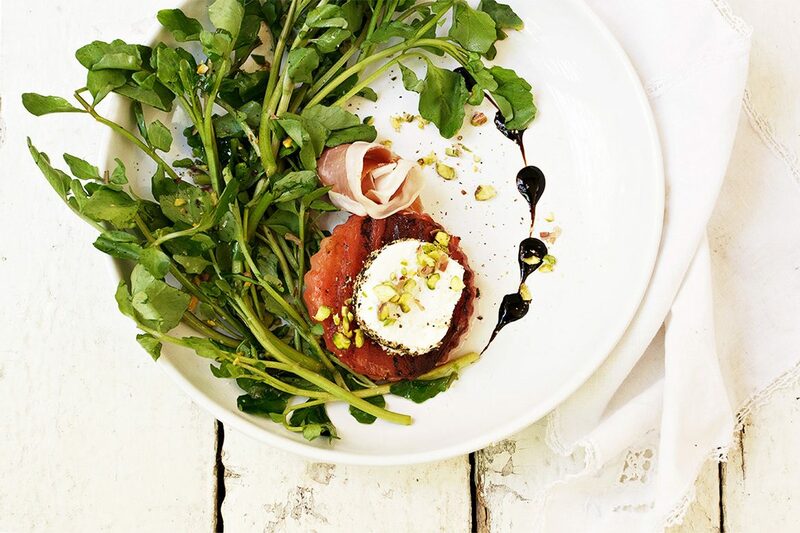 Sprinkle watercress and goat cheese with chopped pistachios. *Balsamic glaze is a reduced and sweetened balsamic vinegar, that is thicker than balsamic vinegar. It is available in with the balsamic vinegar in most stores. Look for a small bottle. 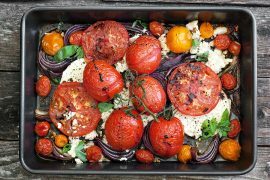 We’re in the midst of a another heatwave and this salad is exactly what I’m craving – love the grilled watermelon! I have to make this for my watermelon-loving husband. I have never tried grilled watermelon but can’t wait! We must eat a whole watermelon each week. Lovely photos and beautiful salad. Hope you’re having a great weekend! Thanks so much, Tricia :) Let me know how he likes it! What a wild idea, I have never tried grilled watermelon, ever, I really must climb out from under my rock…LOL! 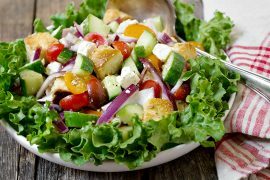 I plan on trying this recipe soon, especially since I adore goat cheese. i’m obsessed with grilled watermelon and this salad looks gorgeous! that creamy goat cheese and those bitter greens…YES!! Everything is better grilled so I can imagine that this is fantastic, Jennifer. It never occurred to me to grill this yummy fruit and now my head is swimming with all kinds of possibilities. I’m loving your gorgeous photos! Oh my goodness, I love grilled watermelon, but mine never looks this gorgeous, Jennifer!! This is a feast for the eyes and the belly! I could definitely eat this beauty daily! Can’t wait to try it this weekend! Cheers! I totally agree with Liz Jennifer! Your presentation is just beautiful! I eat watermelon all summer long too, but have yet to try it grilled. I’m gettin’ on it because this salad looks delicious! I eat so much watermelon in the Summer. It’s the only thing I crave on the hottest of days. 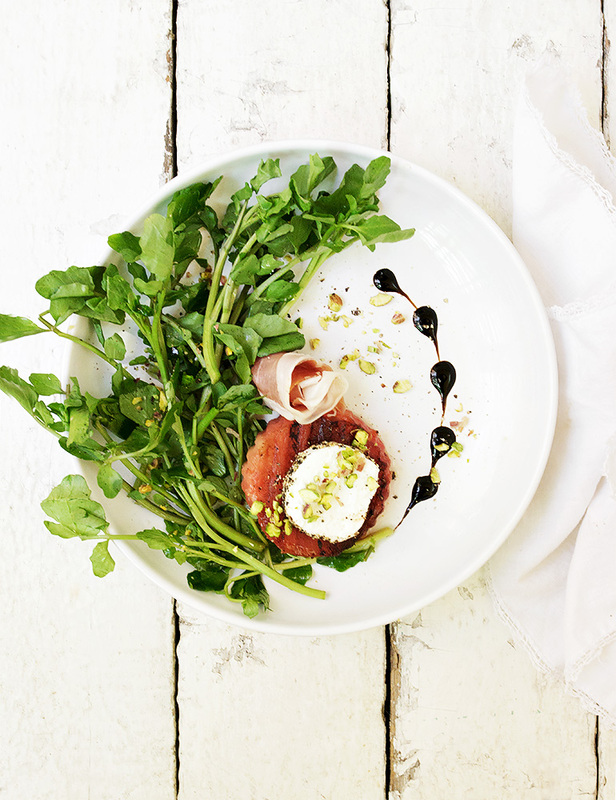 Love this simple, fresh salad and the presentation is awesome!